Guar gum powder is extracted from the endosperm of guar been seeds. The seeds contain good quantity of galactomannan also which makes it applicable for medical industry apart from food, textile, dairy products, etc. This product has excellent viscous property even in low amount powder. It acts as an effective gelling agent. It stays compatible with both dry and wet content. Guar granule is applied either as direct ingredient or in combination with other soluble gum powder as it produces strong viscosity when combined with other gum granule. It is considered as a powerful food additive and a stabilizer in the preparation of extensive range of dairy products and bakery items. Canned food prepared for animals is added with guar gum for several reasons. Guar granule is generally found to be a successful ingredient in gluten free food varieties. When combined with xanthan gum the viscosity increases due to this reason combination of guar and xanthan is considered reliable ingredient for bulk production of pet foods. How Feed Industry benefits by using guar granule as an important Ingredient? Guar granules are tested for their effectiveness in animal foods. Several researches have shown that endosperm of guar seeds lower blood glucose level and contain high quantity of soluble fiber. Animals stay safe even after consuming food products where guar powder is used in more than the required quantity. Purity of guar granule grade is more important. As there are certain issues concerning adulteration in gum powder of guar bean seeds, checking the grade remains a mandatory aspect. When it comes to special feed preparation for veterinary guar gum powder is used as an alternative for calf milk. FAMI QS is the certification given for quality and safety system for preparation of specialty feed ingredients and compositions. This certification illustrates the quality of guar gum grade that can be applied for pet food and special feed preparation. Why Indian Manufacturers are gaining attention for Guar production? 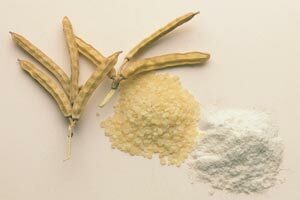 Majority of guar plants are cultivated in India and therefore in India it is common to find guar gum powder exporters. 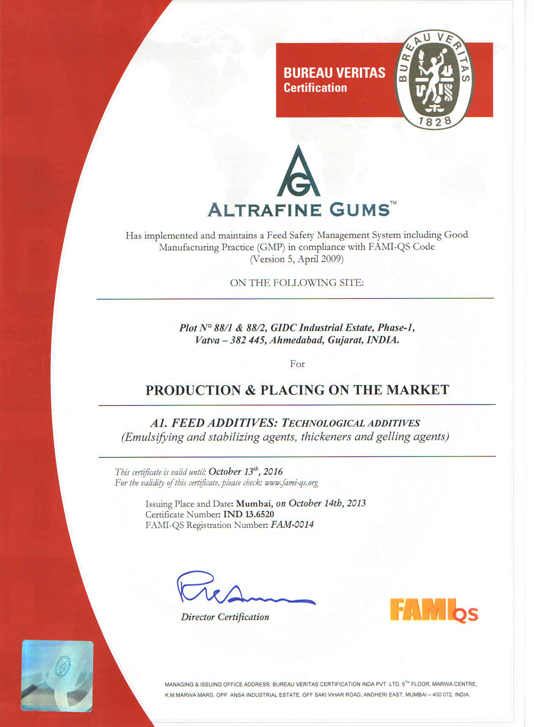 Altrafine is one of the leading companies that supplies special feed grade of FAMI QS certified guar gum. 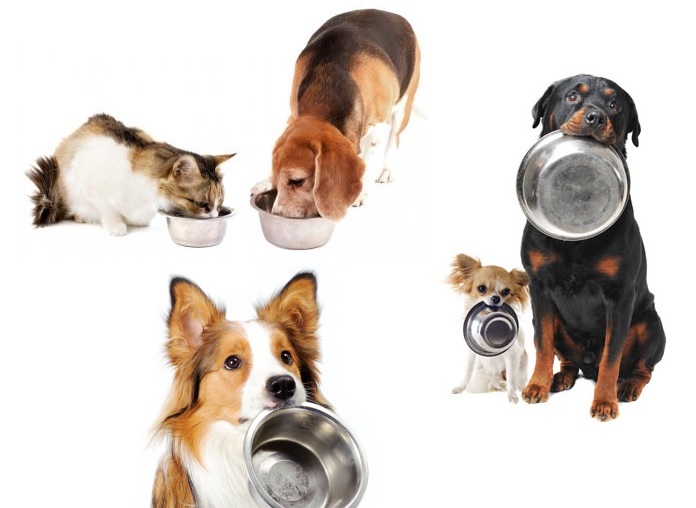 Our products remain reliable choice for pet food and other specialty feed preparation industry. Guar gum powder is found to possess several properties for which it is applied as a suitable ingredient either separately or in combination with other agents. Its fiber quality and viscosity makes it a suitable choice for preparing special feeds. Guar gum powder is extracted from the endosperm of guar plant seeds and the granules are found to posses many properties that make it applicable in many industries. Guar gum acts as a viscous agent, thickener, emulsifier, binding agent, etc. Food industry leads the role in application of guar gum powder. Starting from bakery products to dairy products there are many more food preparations where gomme de guar remains a prominent supporting ingredient. Apart from that it is also applied in pharmaceutical industry as a binder and disintegrating agent. Cat Litter is a special product used at domestic surrounding to let the pet cats excrete inside the litter so that the home atmosphere remains clean. In most of the homes where cat remains a pet animal people prefer to keep litters to avoid cats excrete openly inside the home. Cat litters are specially made from selective ingredients which prevent the odor from filling the room. Cat litters are made from clay and baking soda. These are used to avoid scattering of cat rubbish. When rubbish get scattered it leads to stinking condition and it might easily infect children and sick people as well. 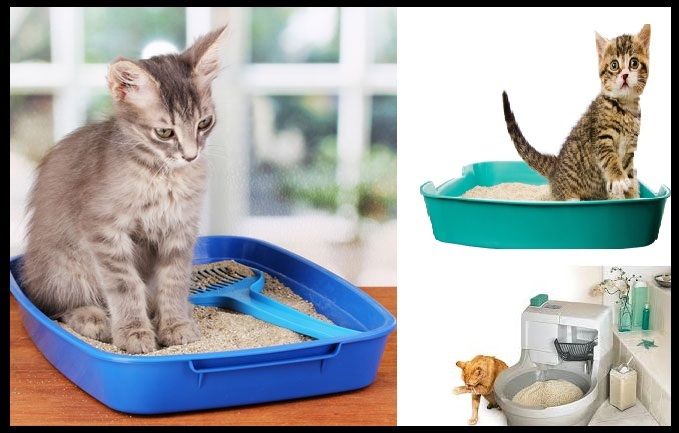 Modern methods of cat litter making make use of special ingredients as an alternative to usual baking soda and clay so that cleaning the litter also remains easier. Guar gum is applied as a clumping agent in the making of cat litter. The reason behind the application of guar gum is that it improves the function of sodium bentonite which is applied to keep the rubbish from spilling out. Guar gum granule binds with sodium bentonite and sustains the things inside the little and reducing the chance for falling apart from the litter circumference. Guar gum is used as a binding agent with other mineral resource as it captures the waste and creates bio-degrading mass for cat urine and motion. What Makes Gum Powder of Guar Seeds suitable for Litter Production? When the excreted materials contact with guar gum powder, guar gum binds with the excreted materials and facilitates for easy cleaning of urine and other rubbish from the litter box. Therefore, for easy cleaning and restricting bacterial growth guar gum remains one of the powerful ingredients. Altrafine processes and supply guar gum powder in different grades for variety of industrial applications. Textile printing, mosquito mats, paper industry, water treatment plant, ceramics, etc are some of the prominent industries where guar powder is considered an important and production friendly ingredient. Our guar gum powder is superior in quality and we supply to different industries worldwide so interested industries buy guar gum powder or inquiry at https://www.altrafine.com/inquiry/. Guar gum powder is applied in cat litter making for the excellent binding property it has. It is found to be very effective in reducing the bacterial growth and stays very helpful while the waste is removed from the little.